Homicide detective Harry Belltree wouldn’t usually be looking too hard at an elderly couple’s suicide pact. Especially now, when his brother-in-law Greg has just been stabbed to death. But it seems Greg and the old couple had ties to the same man, a bent moneylender with friends in high places – and low. mysterious deaths: his parents’. And when he goes off-grid to investigate, that’s when things start to get dangerous. is a triumphant change of direction for Barry Maitland. Readers may be familiar with Maitland’s Brock and Kolla series set in London. He has also dabbled with the stand-alones set in Australia. So this trilogy is quite a new direction for him. Harry Belltree is the son of a prominent solicitor who killed three years earlier in the same road crash that left his wife Jenny blind. Harry is an ex SAS soldier with experience in Afghanistan. He doesn’t reject using violence if he thinks it is necessary. He and his wife Jenny, a computer expert, make a formidable investigative team even though she is blind. So Harry doesn’t always play by the rules, and that tendency combined with corruption in high places in New South Wales, links between bikies and a loan shark, and between them and politicians, makes for a very noir novel, darker than others I have read by Maitland. The cover also tells us that this is the first in a trilogy, so there is more to look forward to. A woman dies in her sleep in a houseboat on the Thames; the apparent cause of death, an unflued gas heater. It all seems straightforward, but DI Kathy Kolla isn’t convinced. caught. It’s one of Brock and Kolla’s bloodiest investigations yet. http://www.allenandunwin.com, and in the USA by St Martin’s Press / Minotaur, http://us.macmillan.com/minotaur.aspx. If I wasn’t convinced of it before, this title firmly sets Barry Maitland in my mind as an Australian crime fiction author up there with the best. His writing is quietly assured, and although there are elements of the plot that strain the bounds of credibility, Maitland is very persuasive. Poor Kathy Kolla seems to be in the firing line in more ways than one in THE RAVEN’S EYE, and both she and David Brock are very plausible and likeable characters. If you share my tastes, then you’ll enjoy this thriller written by an Australian author but set mainly in London.If you haven’t yet met this pair of sleuths then you have a manageable series of 12 titles to tackle. And you know what I will say: read them in order! Although to be honest there is not much overlap from title to title so you can read them as stand alones. faces the fight of his life as his past comes back to haunt him. this Maitland’s best mystery yet. A worthwhile read, #11 in Maitland’s long standing Brock & Kolla series, the first published in 1994. DCI Brock and DI Kolla have been together through so many cases that they have developed a very close relationship despite the difference in their ages. I have included this in my lists for both the 2012 Aussie author challenge and the 2012 British reading challenge, because although Barry Maitland is Australian by adoption/residence, by setting and construct these books are British police procedurals. Fantastic Fiction lists him as a Scottish author. There’s plenty in CHELSEA MANSIONS to keep the grey cells working. The hook is the unexpected murder of an elderly American tourist walking back to her hotel from the Chelsea Flower Show. The murder of a Russian billionaire who is living in the same buildings a matter of days later seems to point to a connection between the two. Enter the fickle finger of fate when DCI Brock contracts the deadly Marburgh virus and Kathy Kolla has to lead the team. And just who is the young Canadian who turns up at Chelsea Mansions? As the story unfolds and mysteries are resolved one by one, there are some plot points that strain credibility just a bit, but that really didn’t matter to me. 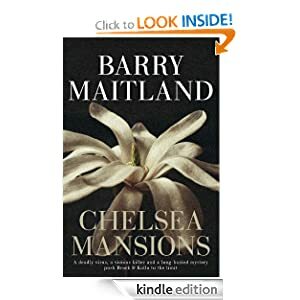 There are a number of connecting threads between CHELSEA MANSIONS and SPIDER TRAP, but that shouldn’t prevent you from reading this if it is your first book by Barry Maitland. I think this one will send you looking for earlier titles. And there are plenty of openings for a sequel to this one. BRIGHT AIR (2008) – stand alone. Mini reviews of ALL MY ENEMIES (1996), NO TRACE (2006), and SPIDER TRAP (2007). Elderly American tourists Nancy Hayes and Emerson Merckle are walking back to their hotel after a lovely day at London’s Chelsea Flower Show when Emerson is rudely knocked to the ground and Nancy falls under a bus and is killed. When describing events to police, bystanders all agree that she was deliberately picked up and thrown under the bus and that there is no way it could have been an accident. DI Kathy Kolla is, not unrealistically, unable to immediately find a reason why a septuagenarian lady from Boston would be deliberately killed in the middle of London. Her investigation soon starts to centre on the hotel at which the pair were staying and its more imposing neighbouring home owned by expat Russian oligarch Mikhail Moszynski and his new wife. 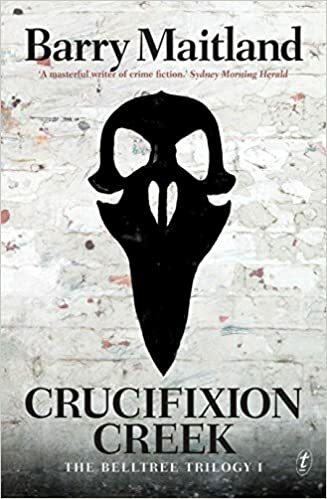 The case has a number of frustrating dead ends before some sense can be made, and more than a little energy is expended when Kolla’s boss, DCI David Brock, nearly loses his life. The story is an excellent one, very tightly plotted and offering all manner of possibilities for a resolution. Though he now writes full time, Maitland was a professor of architecture and this shows in the wonderful detail he brings to life of the area of London in which the book’s events take place. I really was able to picture the buildings, their basements, the private garden shared by the street’s residents and these provided a great backdrop to meeting an eclectic set of suspects, witnesses and potential further victims. The run-down hotel is owned by an ex-army man whose family has owned the building for generations and is staffed by a motley collection of misfits. There is pressure to sell to the neighbouring Russians who want to expand their home even further. There’s also a strange young man who inserts himself into Kolla’s investigation and, as any crime fiction reader will know, people who do that are automatically suspect. But which of these people would throw someone under a bus? And why? I enjoyed meeting Kathy Kolla (definitely the star of this book) and David Brock. The pair have a good working relationship and we see just the right amount of their personal lives to get a good sense of their rounded personalities. In addition to Brock’s brush with death there’s another fairly major incident that affects the whole investigative team and in both instances the two main characters are nicely supportive of each other. Just as well as the bureaucracy they both deal with is pretty unforgiving. It can be hard to ‘break in’ to a long running series but happily I did not feel at a disadvantage for not having read the previous 10 instalments of this series. There was enough back story provided to give me a sense of the characters’ histories but not too much that I am prevented on going back and reading the novels out of order (shocking thought that might be for some). Fans of the series should enjoy the developments in the personal lives of the characters, particularly Brock’s. Without gimmickry or artifice this is an above average police procedural full of characters who invite you into their lives, if only for a while, and a satisfyingly intricate plot. It brings to life a delightful-sounding area of London and reminds us that the past can rarely be truly forgotten. Top reading. 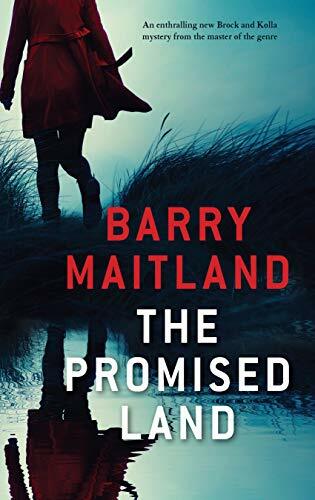 Barry Maitland is Scottish born, London raised and has lived in Australia for nearly 30 years so on balance we feel comfortable claiming this as Aussie crime fiction even though it’s not set here. You can find out more about him from this recent ‘ten terrifying questions’ interview at Booktopia. Kerrie reviewed the previous novel in this series, Dark Mirror, here at Fair Dinkum and at my own blog I reviewed Maitland’s standalone novel Bright Air which is set in Australia. A research student collapses and dies in the London Library, vomiting and going into seizures. It appears that the cause of death is arsenic poisoning. Marion Summers was studying pre-Raphaelite artists and writers, and among them, in the 19th century, use of arsenic was high. There are several plausible theories – one being that she may have been self-administering arsenic to see what would happen. However then Detective Kathy Kolla finds out that there is a side of the Marion, the dead student, that few knew. Just when the evidence of suicide looks pretty conclusive, another student dies in similar circumstances. Is the murderer Marion’s supervisor anxious to protect his reputation from academic disaster, or her violent step-father, or a lover trying to keep their relationship hidden? Barry Maitland is an accomplished layer of false trails, sending the reader off blithely to explore red herrings and dead ends. Your mind tries to assemble the evidence in believable scenarios, and then right at the end, in the final resolution, you realise it has been staring you in the face all along. This is a novel that keeps your mind working all the time, the meaning of the title being just one of the little puzzles. DARK MIRROR is #10 in Barry Maitland’s Brock & Kolla series. I haven’t read them all, but I have enjoyed all that I have read. The relationship between the detective duo is a tantalising one, full of tension, partly generated by the fact that Kolla isn’t always wise, in Brock’s opinion, in the action she chooses to take, and it is an unequal partnership. Last year I remarked that Barry Maitland is one of those authors who may slip under the radar. You’ll find mini reviews for ALL MY ENEMIES, NO TRACE, and SPIDER TRAP in that post. 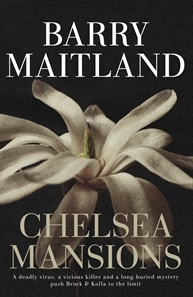 An Australian author, Maitland is interesting because the Brock and Kolla series is authoritatively set in London. Maitland has shown though that he can handle a stand-alone too. See my review of BRIGHT AIR from earlier this year. Maitland’s first mystery The Marx Sisters was a nominee for the John Creasey award for Best First Novel and his second, The Malcontenta, won the 1996 Ned Kelly Award for Best Crime Fiction. Check Maitland’s profile.